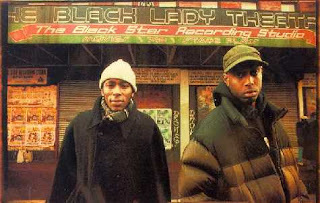 Back in 2003 my friend and I landed tickets to a BlackStar show at SOB's NYC. In terms of venue intimacy SOB's sets the standard. Making our way to the front row was a breeze. I got to give five to surprise guest Dave Chappelle (right before he blew up). Though six years have flown by my memories of the show remain vivid. Recently Mos and Talib have taken fans down memory lane with reunion shows. Rolling Stones posted a review of a late May show: BlackStar's Mos Def, Kweli Dabble Politics at Reunion Show. I can only hope that the duo sharing the stage again is foreshadowing their follow up album- arguably hip hop's most awaited sequel. On "Definition" (see below) Mos and Kweli self proclaim themselves "the best alliance in hip hop," yet they faded into obscurity. Luckily, for BlackStar their classic debut album remains in heavy rotation among loyal listeners. May the stars align again, putting an end to the overdone hip hop is dead drivel. How do you define Hip Hop?